CommonWealth had to dramatically overhaul its content as it went digital, as detailed in previous parts of this series. But the digital transition also faced huge challenges on the business side. Taiwan’s media landscape in the mid-2010s offered bleak prospects for news organizations. The rise of the “platform economy” meant multinational social networks had come to dominate 75 percent of digital advertising revenues, while magazine ad revenue was tumbling 20 percent a year. From 2012 to 2014, tech companies faced increasing pressure on digital advertising, and the market was being squeezed by the entry of native online media vying for ad revenue of its own. Consequently, figuring out how to grab a share of the digital ads distributed by global tech platforms became critical to revenue growth as content was migrating to digital formats. To deal with the challenge, many media set up digital advertising teams, but they were mostly for show. CommonWealth began cultivating its own team in 2009, but it wasn’t until 2015 that it established a dedicated group focused on increasing digital ad revenues. The strategy worked, as digital ad revenue soared 50 percent that year. But General Manager Julia Yeh was not satisfied, believing even faster growth was necessary, and at a major strategy meeting in the summer of 2015, she pushed the idea of setting up a “CW Lab”. Only a dedicated unit, she argued at the time, could handle the complexity of digital ad technology and the more elaborate thought processes involved in digital advertising compared with print ads. “I wanted it to be an independent team. I was hoping the industry would see that CommonWealth Magazine had made an organizational commitment to confront the challenges of a digital ad transformation rather than simply having a few people in our ad department handle it,” Yeh says. Other media tended to position their digital teams within their ad departments or as part of the IT department managing the back end of the system. But for CommonWealth, the creation of the CW Lab solidified its foundation for digital ad growth. In 2016, the year the CW Lab was launched, CommonWealth’s digital ad revenues grew another 60 percent, and a year later, they surpassed revenues from print ads. A key source of that growth was the development of horizontal communication channels internally. This enabled all CommonWealth units involved in digital advertising, including the digital operations team and the IT, advertising and marketing departments, to participate in digital advertising decisions and promote its growth. With its freedom to develop ideas and bring in the staff it needed, the CW Lab was able to roll out services involving system research, UI/UX, visual design, and front-end connections that gradually earned customers’ trust. But it took time to develop the necessary skills. The content of many ads for luxury products came directly from Europe, for example, and CommonWealth Magazine had to be able to communicate with the companies proposing those ads. That was not something the two digital ad salespeople in the advertising department could understand. Even the “performance report” asked for by clients was not something print ad salespeople had ever dealt with. Beyond providing extensive training internally on digital issues, CommonWealth also had to familiarize customers on the outside with its digital ad capabilities. CW Lab Director Ming-fang Li took salespeople on a “roadshow” to visit 23 media brokers, 18 of whom dealt exclusively with digital ads, but none of the young contacts responsible for digital advertising at those 18 companies had ever heard of CommonWealth. Internal staff training was geared to giving the advertising department the ability to provide “consulting” services. Nearly every analytical system that could boost digital sales was purchased, enabling ad department staff to clearly interpret data, manage social communities, and write more eye-catching copy. In media companies, ad revenue is quickly reflected on the bottom line, but marketing efforts take longer to show results. That’s why the digital transformation, which relied heavily on marketing, took time to deliver on its promise. CommonWealth’s marketing department had to master two skills simultaneously: One was the ability to sell digital content to offset the drop in print ad revenue; the other was to use digital tools to effectively reach large numbers of people and find those who liked CommonWealth’s content. Yeh felt that digital tools could help the company more clearly understand readers’ needs and behavior, but it meant having to learn many new things and gain experience through trial and error. Unfortunately, the initial results did not meet expectations. When CommonWealth helped customers run a dedicated website on their behalf, for example, getting drafts of content approved took up to three months, compared with the three days it took to get a customer’s print ad ready. Thus, while everybody worked to the point of exhaustion, sales were no better than they were before – customers simply shifted their spending from print to digital. During this conversion process from the old to the new, “print wasn’t as lacking in value as it appeared, but digital wasn’t that powerful,” says Yeh, who was determined to drive the company into the modern era while still controlling costs, manpower and time. These were all pain points encountered every day during the digital transition. The arduous digital transformation took its toll on employees, leading to extremely high turnover in the marketing department. But Yeh remained firm in her belief that she wanted to find people willing to learn new things. “We wanted to assemble a group of people who genuinely wanted to understand how to do digital. It felt a little like a pilgrimage. Even though the work was really, really grueling, people still wanted to stick around because they could see new approaches that were not being used elsewhere,” Yeh says. From 2015 to 2017, CommonWealth built a good reputation in business circles for its digital advertising and digital marketing, and its numbers were strong. In 2018, however, growth was stagnant because of limited public and private sector investment. With a renewed emphasis in 2018 on print ads and marketing, however, the magazine booked nearly 100 pages of ads for its special anniversary addition “Travel Beautiful Taiwan”, a result that had not been seen for a long time. The trust that customers had in the CommonWealth brand and in the skills and expertise of its salespeople were ultimately the best guarantors of good results, Yeh found, though even that had its limitations. The biggest challenge for a media company attempting a digital transformation is maintaining its traditional advantages while creating new revenue sources. CommonWealth met the test through an organic innovation model that unexpectedly generated new ecosystems. The typical mass media model revolves around fashioning attractive content that captivates large audiences. But the rise of social networking platforms led traditional media geared to mass markets to realize that the customer stickiness and loyalty brought by segmentation is an increasingly important asset. With that in mind, CommonWealth decided in 2013 to set up online sub-channels catering to distinctive audiences. The first was Opinion@CommonWealth, which publishes op-ed pieces from opinion leaders and authoritative voices. That was followed in 2014 by CW Leader Campus, dedicated to e-learning for business professionals. It takes content from CommonWealth reports and forums and even Cheers Magazine and converts it into corporate training “courses” in video, audio, and text formats. The site’s membership has risen by about 60 percent a year and exceeded 95,000 corporate members in 2018. After the strategic meeting in 2015, CommonWealth decided to launch the sub-channel Crossing targeted at young communities with an interest in the world at large. In 2016, the company adapted the classic Taiwan 319 Villages product on local travel into the Smiling Taiwan sub-channel that appeals to people who love to explore Taiwan and connects young people engaged in placemaking. A year later, corporate fans drawn to CommonWealth’s commitment to corporate social responsibility (CSR) for the previous 10 years were brought together on a new platform known as CSR@CommonWealth. Within a year, the site was garnering more than 200,000 monthly visits, establishing itself as Taiwan’s leading online advocate of CSR issues. CSR@CommonWealth has its own independent editorial team, while the advertising department prepares special reports on the site’s eight major corporate sponsors and helps market that content, a separation of responsibilities that maintains the channel’s credibility. In 2018, CommonWealth decided to create a space for fans of the long-running “City Happiness Survey” similar to the CSR website called Future City@CommonWealth. The site has 12 corporate sponsors and has built its audience to 130,000 views a month in less than a year. Initiating one new sub-channel a year has demonstrated unusual efficiency for a company evolving from a monthly magazine into a digital media organization. The transition from print to digital content has made a deep impression on Fu-Yuan Hsiao, who heads research and development in the New Business Department. As a reporter for more than 20 years, she was accustomed during the print era to focusing on a single issue at a time. Once stories on the topic were completed, they would be published in the magazine, and then it would on to the next topic. The routine made it hard to expand a story’s impact, and there was little direct contact with readers. Young ethnic-Chinese writers living around the world offer unique perspectives on international developments, careers, and the global political and economic situation. The sub-channels’ success resulted in part from the strong emphasis put on content marketing, exemplified by the efforts made by each channel’s social media editor to find the best partner websites with which to share and promote each other’s content. They benefited from the powerful media entities within the CommonWealth Magazine Group itself that had their own extensive social communities, including CommonHealth, Cheers, Parenting, and CommonWealth Magazine Publishing, which have created “spillover” effects for the sub-channels. The narrowly focused CSR@CommonWealth, for example, often teams up with Cheers, Parenting or even Opinion@CommonWealth, which pay attention to similar issues. Simply spreading the word about these sub-channels on affiliated sites has helped boost their traffic. Smiling Taiwan’s Li was reminded of an old CommonWealth slogan – “CommonWealth will go wherever readers are” – when thinking of this cross-marketing approach. Today, the company has to search for readers even more aggressively, figure where they can be found, and then provide them with the most interesting content at a particular time and place. That has led to change in thinking. In the past, the editorial department had the attitude that it was “telling stories to readers.” But CommonWealth’s native digital sub-channels actively listen and respond to reader’s needs and interests. Here’s an example: Just over a year after being launched, Crossing’s visits had increased to 1.5 million, and its community had a high degree of stickiness, with an average “time on site” of 4-5 minutes. Support was so strong that tickets to a quarterly “meet a writer” event were being snapped up in no time. That positive response led Crossing Director Hsiang-yi Chang to compile the site’s most popular articles into a print edition of the magazine. The gambit was so successful that the marketing department saw a subscription market for similar editions published quarterly – an example of the responsiveness of the sub-channel to reader’s needs. It also typified a new O2O (online to offline) profit model focused on converting native digital content into print products. Opinion@CommonWealth used a similar approach at the beginning of 2018, holding a “meet the writer” event to remember the 20th anniversary of anti-Chinese riots in Indonesia. The tickets sold out immediately, and while the revenue did not add up to much, the event brought CommonWealth closer to groups that previously were unfamiliar with the magazine. When CommonWealth Magazine was founded in 1981, it was targeted at a segment of readers generally interested in business and finance. This tradition of “having specific readers in mind” has led to the creation of a new sub-channel a year as part of the company’s digital transformation, resulting in new, fertile ecosystems featuring platforms for groups with different interests. After the CommonWealth website’s paywall took effect, the sub-channels’ free content not only helped maintain the website’s traffic but also increased the number of advertising slots available to target specific customer segments. Public Television Service Chairman Chen Shun-hsiao, media observer Dennis Huang, and National Chengchi University College of Communication professor Su Herng all feel CommonWealth has found the right formula for its digital transformation. The company branched out early on into specialized products such as CommonHealth and Parenting and then proceeded to vertically integrated sub-channels, a strategy that was praised by Chen. “CommonWealth has engineered the most successful digital transformation of any traditional media,” he says. In the past, media monopolized the distribution of news, and its content was wide-ranging, Chen observes, but today, readers can freely access the best content providers in many different fields and no longer need to rely on big media to aggregate content. The best response for integrated, large-scale media organizations, Chen believes, is to break up into medium-sized media that focus on different themes and develop their own profit models, helping diversify risk. “We all have different world views. The days of sticking with one media outlet for all our news are over,” Chen says. He himself is now in the habit of putting together his own “media organization” by following more than 200 media outlets and the Facebook and Twitter accounts of 160 friends who share significant developments. From a corporate perspective, Huang compares CommonWealth’s use of segmented sub-channels to an aircraft carrier dispatching assault craft to scout the surrounding sea, referring to their agility and ability to reduce the risk to the mothership. They can solve the challenge of extending the reach of the core brand’s content while also dispelling the stereotype of CommonWealth as a print media. In the past, Huang says, CommonWealth’s expansion strategy relied primarily on self-sufficiency and organic growth. But he argued it may be time for the company to consider partnering with smaller media and even inviting individual writers with potential on board. “The biggest problem for traditional media is not that it doesn’t have content but rather that it doesn’t have good business models,” Huang says bluntly. He suggests that CommonWealth should set a goal of establishing within a few years a sound revenue structure based on the idea that “content has value,” because its main competitors in the media market of the future will no longer only be traditional commercial media. This story of digital transformation may seem to have followed a logical progression, but in fact the experience has been full of pitfalls and tumbles. Ultimately, however, CommonWealth Magazine’s digital transformation has been founded on generating high-quality online news and content by assembling a strong pool of talent, both old and new, and upholding core media values. At a time when many are questioning whether the media has reason to exist, this model has demonstrated its value and viability. Having begun as a monthly magazine 37 years ago, CommonWealth Magazine has taken the bold step of going digital and developing a new business model focused on the value of content. 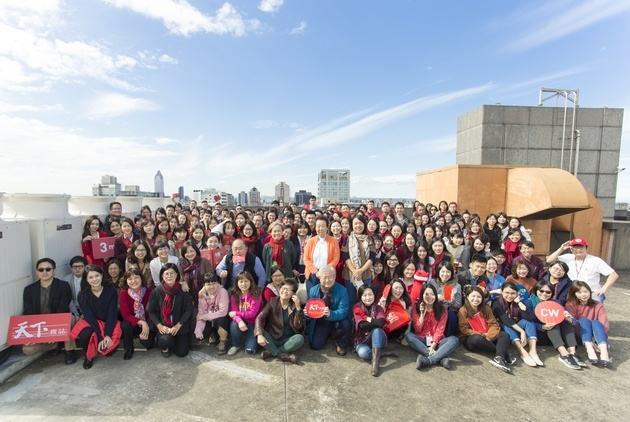 Yet it will also stay true to its initial mission – “to serve as a warm and calm voice for Taiwanese society in the pursuit of a better and more equitable world” – believing that, indeed, hope is eternal.